The summit will be a chance for the Taoiseach to underline Ireland’s specific interests and concerns. DAVID CAMERON, WHO pushed EU leaders for a special deal for Britain before losing a referendum on EU membership at home, will today meet European leaders for the first time since last week’s vote. 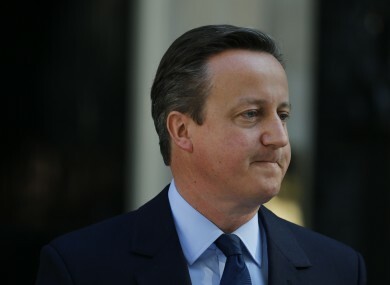 British Prime Minister Cameron, who announced he would stand down after losing the Brexit vote, has said he will leave it to his successor to begin the process of withdrawing from the EU. However, spurned EU leaders will press Britain to waste no time triggering its divorce from the bloc at a tense summit this morning, while trying to plot a future course through a crisis that has rocked global markets. Germany, France and Italy agreed on the eve of the summit in Brussels that there could be no talks on Britain’s relations with the group until after it has formally notified the European Union of its intention to leave by invoking Article 50 of the Lisbon Treaty. The talks are expected to prepare the way for exit, addressing issues such as the phasing out of UK budget payments, the completion of existing programmes in which the UK takes part, the status of UK officials in Brussels and other concerns. Cameron will first sit down with EU President Donald Tusk, before the European Council meets later in the day. Later, the British prime minister will “explain the situation” to his fellow leaders over a dinner, according to an invitation letter from Tusk. Britain’s reluctance to start divorce proceedings has led some countries to think there may be space for a solution to keep it in the bloc, with Poland’s ruling party chief suggesting yesterday there should be a second referendum. But hawks including France are taking a harder line, with Hollande telling Britain it should “not waste time”. Tomorrow, Cameron will be left out of the room as leaders of the remaining 27 EU states discuss the future of the EU amid fears of a domino effect of referendums in eurosceptic countries. Read: ‘Sectarian headcount’ or ‘democratic imperative’: Is it time for a border poll? Email “EU leaders are looking for a quick divorce from David Cameron”. Feedback on “EU leaders are looking for a quick divorce from David Cameron”.